It is October and my instincts to cozy up, bake, can and create are pulsing. Last week, I had a crafty idea. Often, my ideas are flops as far as “final product” is concerned. When creating with kids, I think the process is more important than the object and that can be hard for adults, myself included. I want something to show for all that work! It is really tempting for me to stop Ruby from dragging her paintbrush over the same spot for 10 minutes. I don’t want a hole in the soggy paper. But she is all about trying to paint a hole, that is her intention. Similarly, Margot will spend a lot of time sculpting something and then cut it into a zillion tiny pieces that become play food for her kitchen. A kid’s creative process is so magical and meandering. It is wonderful when I let go and follow their lead, remember what it was like to make for the sake of making. Do you remember that? All of that is to say that this idea was fun AND we landed with something to exhibit! Also, it satisfied my crafty criteria: uses stuff we already have on hand, involves and interests both of my kids and me and allows for creative, individual interpretation. 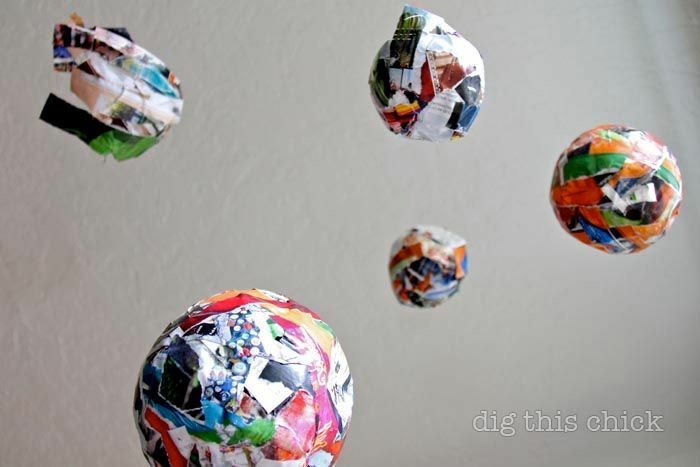 Blow up balloons to different sizes, rip up paper. Pour a few tablespoons of glue into a flat bottomed bowl and mixed with a few tablespoons of water. Place balloon in stabilizing vessel (they are slippery puppies!). 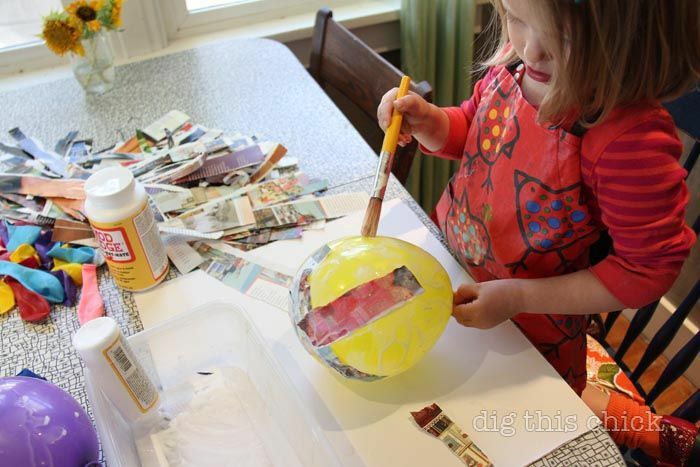 Using paintbrushes and hands, coat the balloon and paper pieces with glue and stick to balloon. Cover as much or as little as you’d like. Allow to dry in direct sun or a warm spot by propping upright in a container and moving every 10 minutes so it doesn’t stick to the container. They will be dry to the touch really quickly but wait a bit to pop balloon because the glue against the balloon is still wet. I popped them (with a tack) after about 30 minutes and the deflating balloon pulled the pumpkin out of shape, sucked it all in on itself. I should have waited a few hours. Ruby loved the balloon popping. Is was crackling and squeaking and the pumpkin contorted like there was a mouse inside. To push my shape back out, I stuck a chopstick down through the stem and carefully reshaped. Then we set aside for a few hours to harden and thoroughly dry (we actually left them outside overnight and they got rained on and had to dry again but, in theory, a few dry hours would have worked too!). 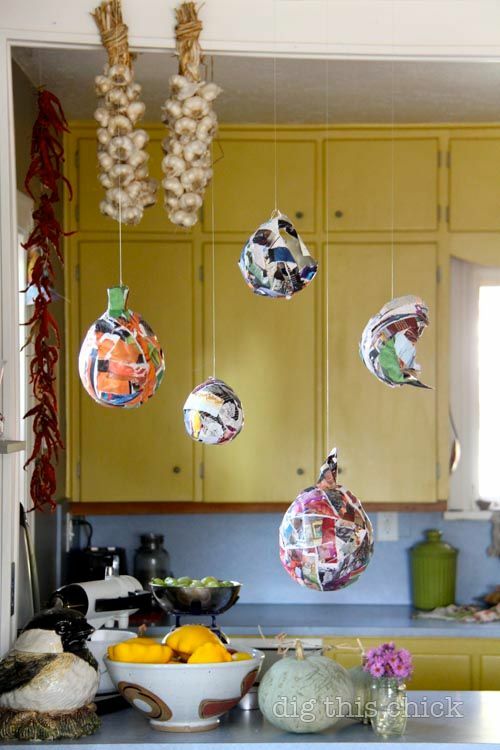 To hang, poke a hole in a thick, stable part of the shape with a nail, thread fishing line and hang. They’d also be sweet lounging on a mantle or something. I chose to group colors for mine, wanting an orange pumpkin with a green stem. Margot and I made another together where she chose the paper and directed the placement and I did the glueing. And, Margot made her own. “It’s a different kind of pumpkin, mama.” My little Ab Ex sculptor. The next day when Margot napped, Ruby and I worked on a few smaller pieces. 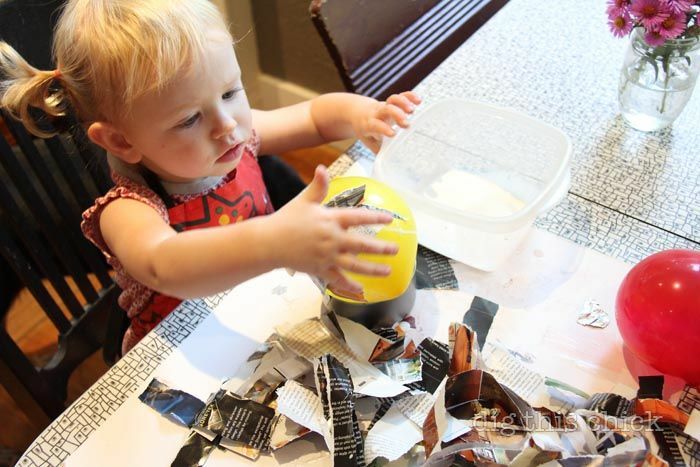 At her age, she doesn’t care as much about what paper she is using or what she is making. She just wants to participate, contribute, experiment and play. So she dipped paper and fingers in glue. She picked out the balloons we used, helped me smooth the strips and chose the tack colors for hanging. We hung our arrangement over the kitchen table. I find that any time I do anything in our home — put the kids to bed, can peaches, sweep the floor, change the cat litter, hang paper pumpkins — I think about moving away from this space, our home. 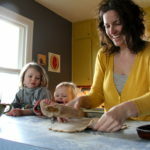 In this week’s mama digs, I wrote about that wild process and what it feels like for me. Click to read heart home. Next up, tomato sauce and costumes! Margot recently shifted from wanting to be a lion-duck to a sun-moon. Sister likes the hybrid costumes. What are you cooking up/crafting about/ making out there? Awesome Nici! I have great memories of being a little kid making apple dolls around our wood stove back in VT. I loved it. Of course, “apple dolls” equals “shrunken corpse heads” after about two days, but still! That sweet little house does hold so many fond memories…. Memories are like a really great friend, you’ll always have them and it so wonderful to make new ones! Remember what I told you…”grow where you are planted”…..I love you Burb! Beautiful. Precisely why we haven’t been able to pry ourselves for our less-than-functional old house of 15 years. Best of luck to you guys! So… tell us! Did they in fact buy your house?!? I bet you won’t miss having to prep the house for showings. We had our house up for sale several years ago for a little over a month and it was TORTURE. We ended up staying in our home after all (the house we had purchased was conditional on selling our home and they sold it to others after we were unable to go firm on our offer) and I’m not looking forward to going through the process all over again in a couple more years. I feel your pain! It’s crazy and gut-wrenching and exciting and terrifying all at the same time. Good luck–hope your house isn’t on the market too much longer! I am so making those. Thank you – i love the step by step. Remember my dream from virgin harvest 2010 of growing my own pumpkin patch? We did it. I have now harvested 4 pumpkins with more on the vine. yay! thanks for so much inspiration. on other making fronts – i found some cool blue green fabric with bikes that i had to have and now i’m making a bulletin board with an old frame and a cardboard backing. B and I have been talking about leaves and I think some leaf mobiles are also on our list. I love the image from today’s Lode of you and Andy smiling in the late evening as you look inside your house and feel the wonder and love the prospective buyers were radiating. It’s tough to say goodbye to the walls that helped create your family, and I can’t wait to read about how you process the change. As the mama of three, I think some great advice [hint, Andy!] is to birth a third babe at home in your ‘new’ home. What better way to start a great connection to the ‘new’ space, right? haha. I’ve totally been thinking about doing this. I think I got a kick to do it. They look awesome girls! We are Do. Ing. This. Well, in a week or two. Note about my box-o-randoms to follow…sometime. ps – Your girls are breathtakingly gorgeous. 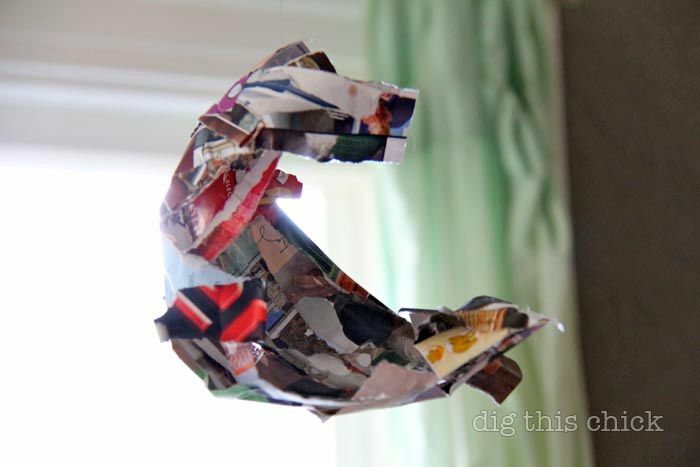 I’ve done a similar style of project (but for Christmas and easter) made from tissue paper and modge podge (the sparkly tissue paper from the dollar store rocks!). 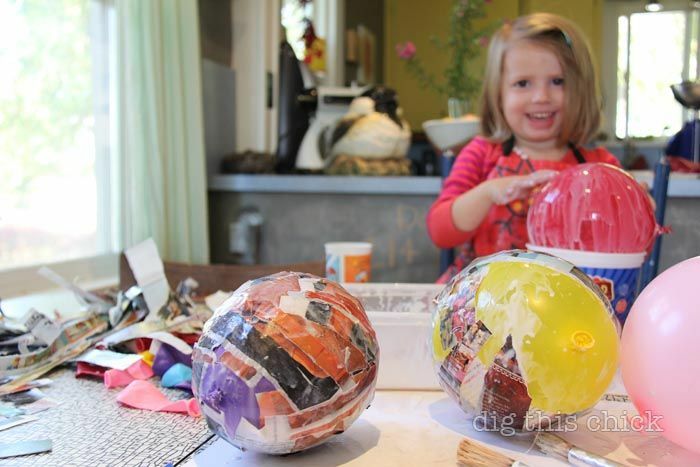 Pop the balloon after it dries and fill it with little treasures and cover the hole with more tissue paper. It’s a surprise gift ball. But the pumpkins. And to do it with Alex. Oh man…she will burst at the seams. Thanks for the inspiration. I love those pumpkins. 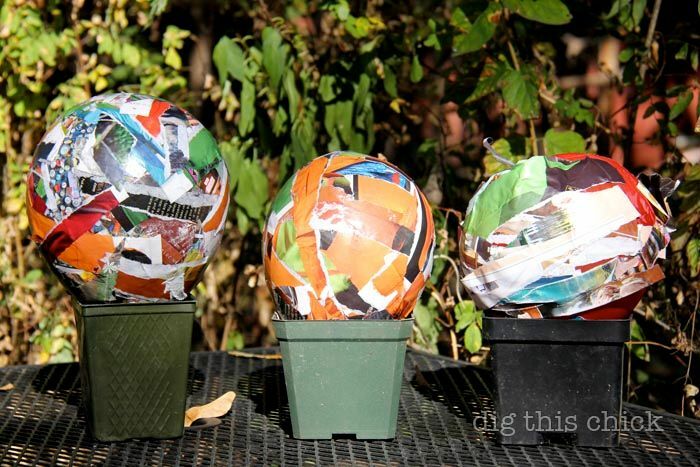 We used a similar process this summer for balloon piggybanks (must post pictures). 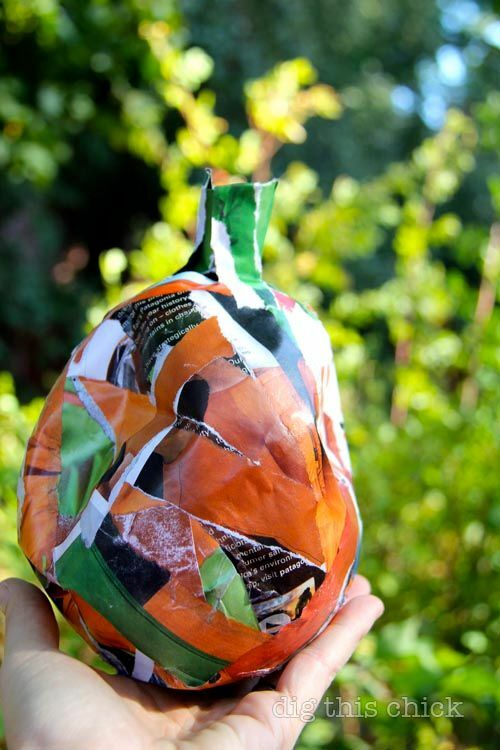 We used pieces of egg carton glued onto the paper covered balloon as legs and a snout, covered with more paper – et voila! Thanks for the reminder to allow the kids their process in making art! Very cool and so fun! I remember making a giant egg-shaped pinata for my 5(?) bday and loved messing with the gluey strips of paper. The pic of Ruby with her little balloon is sweet. And Ivy wants to be Elton John for Halloween…I’m dead serious, ELTON! FREAKING! JOHN! It’s gonna be interesting. I’m so curious to hear why you decided to move. Did that family buy your house? Erin: Yay for your pumpkin patch! Awesome. We only got ONE pumpkin this year and it is tiny. But mighty. Kindred: The chickadee was a gift! Made in Montana, I am pretty sure. There is a website on the bottom: bigskycarvers.com. Oooh I lurve your PUMPKINS 🙂 Very cool!!!! We too are going to sell & move…..a mixture of emotions in my heart right now! I hear you sister! I so so so loved making these as a little girl – so fun! Love that you do so much wonderfully crafty stuff w/ the kiddos. What wonderful memories they’re going to have! Great idea! I also have little ones that I like to get involved in creativity and add their fun projects to the home decor. Thanks for sharing!